Unirii Square (to be translated as the “Union Square”) is one of the biggest and most beautiful squares in Timisoara. 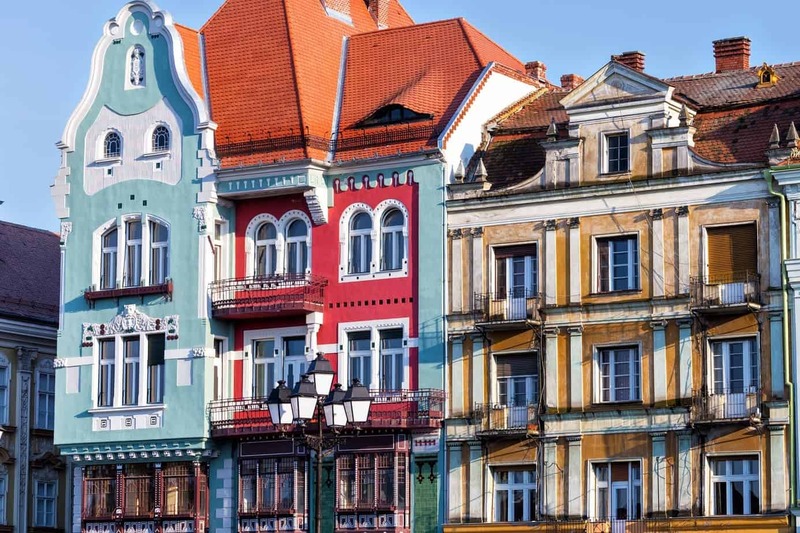 Throughout its history, the square has had many names: it was once called Hauptplatz (main square), Domplatz (Dom square) or Losonczy square.Today we know it as Unirii Square. It received this name in 1919, after World War I and after the Banat region became a part of the now “complete” Romanian country. The square is said to be the place where the Romanian army stopped when they came to Timisoara. The Catholic Dome in Unirii Square was built around the same time as the square itself, after the plans of Fischer von Erlach, an Austrian architect who also worked on monuments from Vienna, Prague, Gratz, and Salzburg. The towers of the dome have a height of only 35.5m, which is quite unusual for catholic domes. But there is a reason behind it. Back in the 18th century, Timisoara became a military strategic point, but was still a potential target. Higher towers would have been visible from outside of the city citadel, therefore making it a target. By projecting the towers at this height, it was “hid” from potential attackers. Between the 14th and 18th century the plague killed millions of people in Europe. Timisoara was no exception. The Holy Trinity monument was ordered and then donated to Timisoara by Dechan de Hansen, who was a counsellor at the city hall at the time. 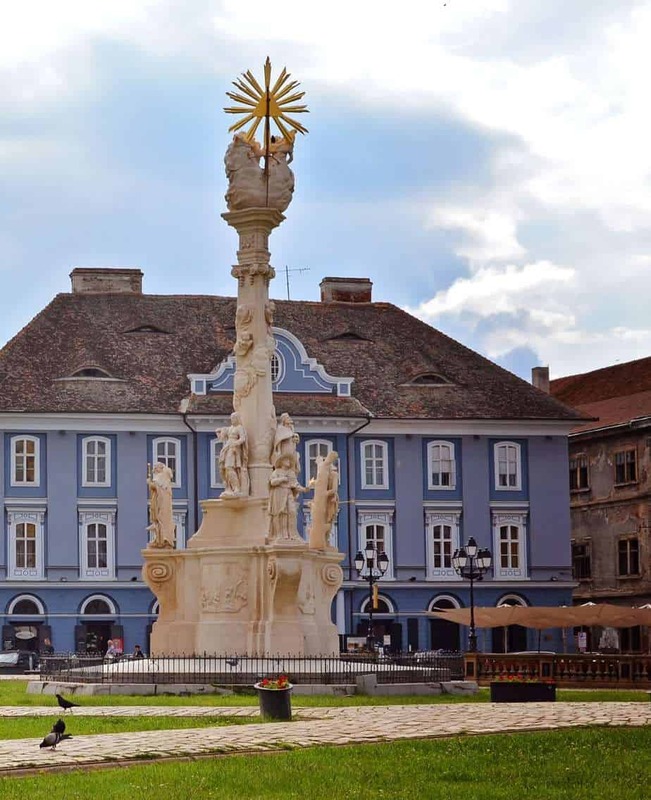 The monument was constructed in Vienna and transported to Timisoara by boat on the Danube, the Tisa and the Bega River, to the old town port. The story has it that the plague killed the counsellor’s wife and daughter and he swore that if he survives he will build a monument as a sign of thankfulness. He kept his word and the monument exists even today. Timisoara has always been multicultural and communities have always lived together in harmony here. In Unirii Square you can find two churches belonging to different religions in the same area. The Serbian-Orthodox Episcopal Palace is one of the most beautiful buildings here. 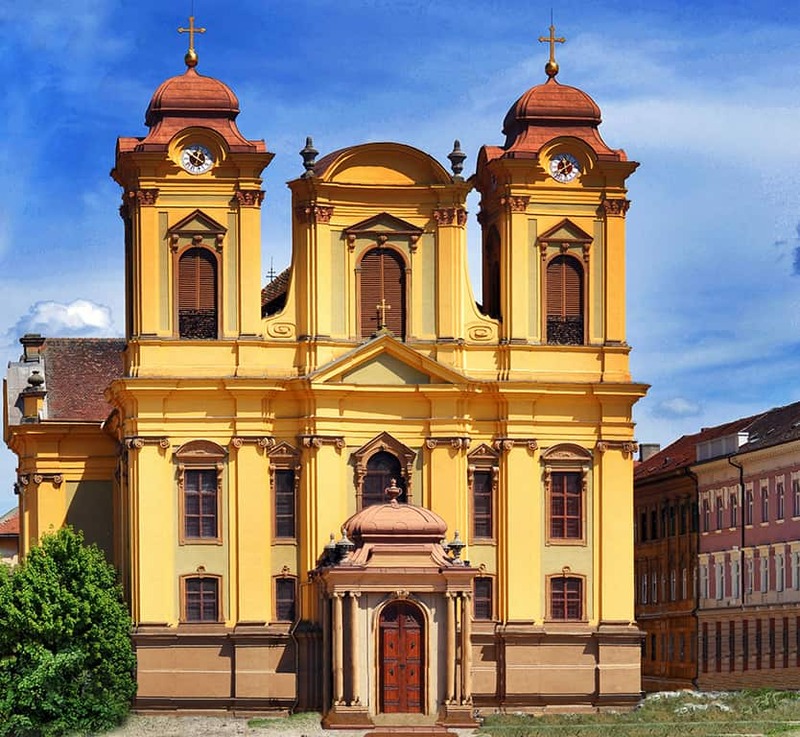 It was built around 1745, and as the years passed it was renovated once in 1905 by the great head-architect Lazlo Szekely, who added baroque elements and later in 2013. The present building was built in the early 1900s in the style of the Hungarian “Secession” current. It was ordered by the pharmacist Salomon Bruck. A pharmacy exists there even today. On the windows you can also see the word “pharmacy” written in the three languages spoken in the city at the time: Romanian, German and Hungarian. What is your favourite building in Unirii Square?